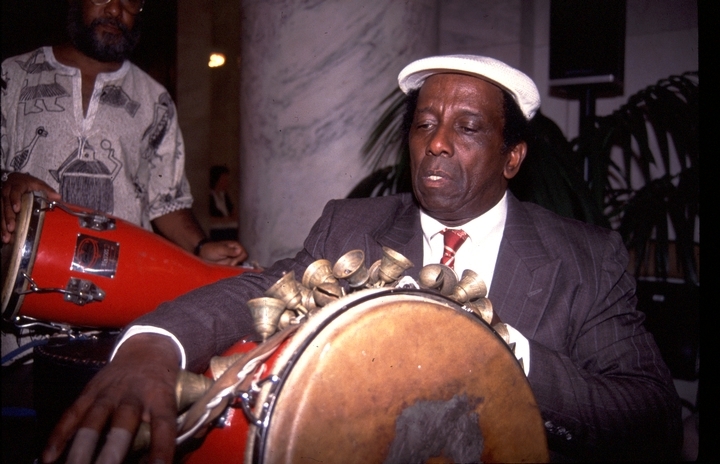 Francisco Aguabella was raised in the Matanzas drumming tradition of Cuba. 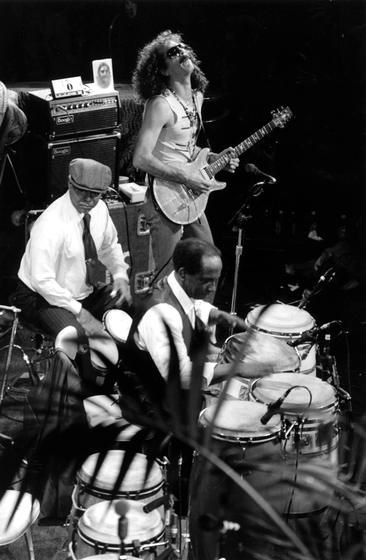 In 1953, he immigrated to the United States and established himself in California as an olu batá (batá drummer). 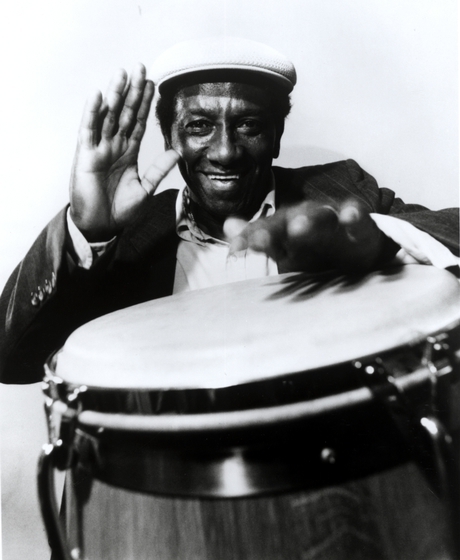 Batá drumming is a ceremonial musical style that plays an integral role in the African-derived religion of Santería, practiced in Cuba, Puerto Rico and, since the 1950s, in the United States. No other music of the Americas bears a more striking similarity to West African music than batá. Its set of three double-conical drums replicates the Nigerian Yoruba drum ensemble of the same name. 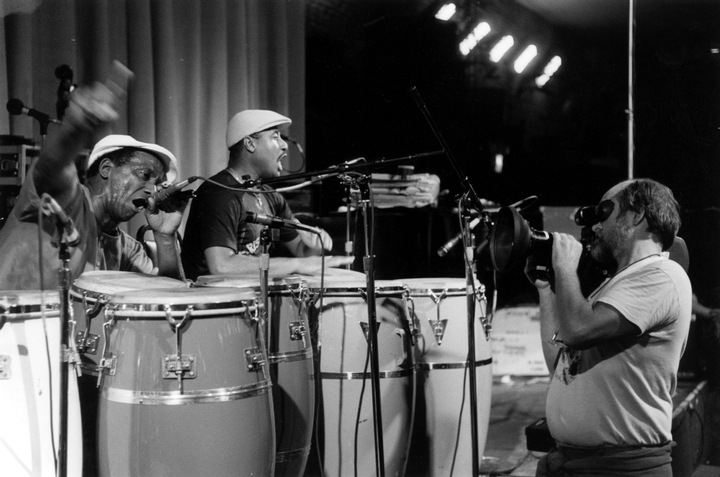 Many of the rhythms closely resemble their African prototypes, and the Afro-Cuban language of Lucumí, in which Aguabella sings, is clearly a derivation of Yoruba. 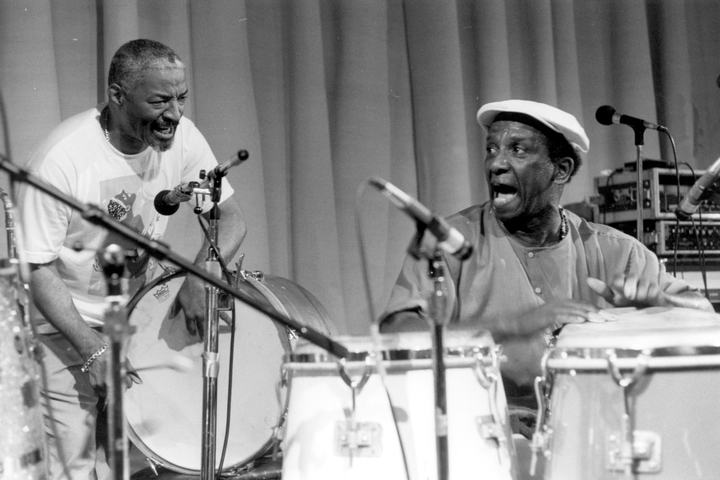 Before 1980, Aguabella and Julito Collazo were the only olu batá in the United States who had been initiated into a secret society of drummers designated to perform a highly sacred type of batá known as batá fundamento. The batá fundamento is an integral part of Santería ceremonies in which an individual's initiation into the religion cannot be consecrated unless he or she has been presented before this sacred ensemble. Annually, Aguabella built a shrine to his patron saint, Santa Barbara (Changó), and performed music at a birthday party held in her honor. It is an all-day celebration for invited friends, who are mainly, but not exclusively, members of the Santería sect. "Santa Barbara knows that it is her birthday," Aguabella said. "I know how she feels. She feels content. If I do not honor her, I feel bad. That's why on Santa Barbara's Day, December 3, whatever work I'm doing, I work for nobody this day.... I love this saint very much.... I promised her that I would have a fiesta every year." 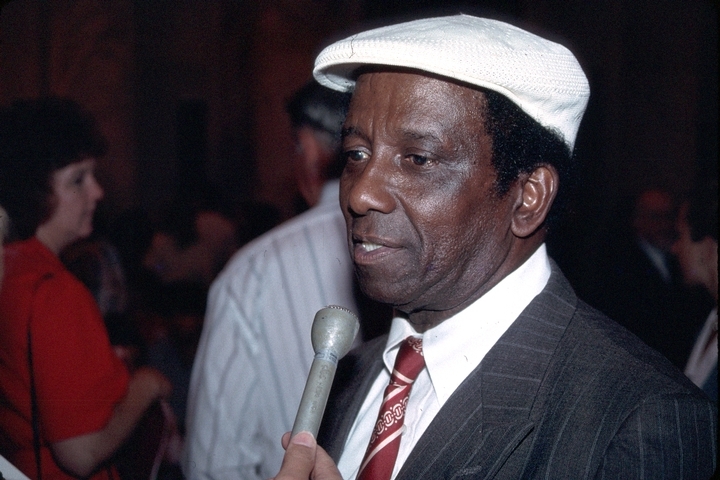 Although Aguabella was widely respected for his sacred drumming, he was equally well known for his virtuosity in secular forms of Afro-Cuban music. The choreographer Katherine Dunham was so impressed with Aguabella's drumming that she invited him to join her company for tours of South America and Europe. The most influential of Aguabella's secular styles is the rumba, a complex of several musical genres that evolved in Cuba around the beginning of the twentieth century. The rumba was the basis of much of Cuban dance hall music that, in turn, helped to shape American popular music through American-based dance bands. Yet the Afro-Cuban rumba bears little resemblance to the ballroom dance rhumba that it inspired. The rumba, as Aguabella said, "is part of the daily life for many Afro-Cubans. It doesn't have to be a special day to play the rumba. We could start a rumba right here with no drum. You could play it here or over there on the wall.... In Cuba, rumba is twenty-four hours a day. We meet on a corner and have a drink ... and someone says, 'Why don't we play a little rumba?' Somebody plays the wall, and somebody else plays a bottle and perhaps takes a bottle cap and 'ca ca ca ca ca' and starts the rumba." Aguabella's goal was to maintain the integrity of the tradition that he so deeply respected, while incorporating it into "crossover" music aimed at broader audiences. 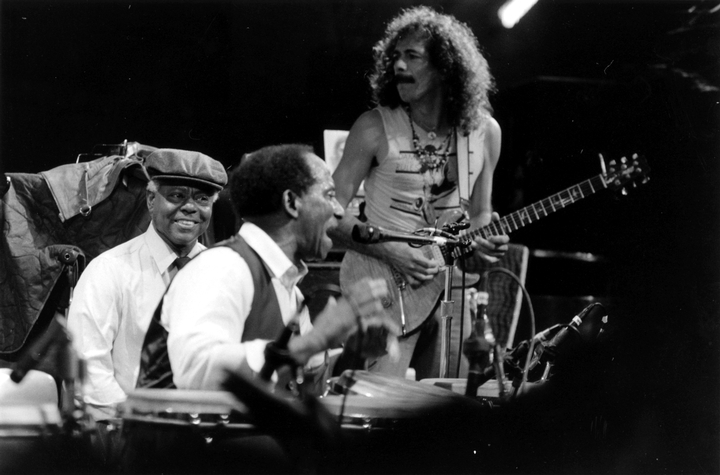 It was his superior musical skill and commitment to tradition that led musicians such as Mongo Santamaría, Malo and Carlos Santana to bring him into their groups. He passed his skills on to others, such as the graduate and undergraduates he taught at the University of California, Los Angeles. Love, Jacqueline. "Ghanaian Event Celebrates End of Famine." Oregonian (August 23, 1999). "Out of Africa." Time (April 6, 1992). Vega, Marta Moreno. "The Yorum Orisha Tradition Comes to New York City." African American Review (summer 1995) 29, 2: 201. Sworn to the Drum: A Tribute to Francisco Aguabella. 16mm, videotape, color, 54 minutes. Directed by Les Blank, with Maureen Gosling. El Cerrito, California: Flower Films, 1995.